Pour into a 9-inch deep dish pie pan. Set aside, uncovered. 138 Comments on "Chicken Pot Pie"
Hi Jenny, I don’t know if you make dishes with shredded chicken, but I just learned a trick from Jennifer L. Scott of The Daily Connoisseur, who has 4 children and often does freezer cooking in large batches. Anyway, her trick to shred chicken quickly is to cook several breasts in broth in a crock pot overnight on low (but you can do it on the stove, too) and then drain the broth to save and put the breasts into your Kitchen Aid with the paddle attachment and turn it on. Voila! Shredded chicken in no time! Thank you so much. This was very easy and my wife and kids loved it. We cooked the chicken breasts in a slow cooker and added that shredded chicken instead of frying. We also used frozen peas and carrots for the veggies. I’ll use fresh veggies when I have more time. Thanks again! This pot pie LOOKED delicious, so I tried it. As I was making it, I had doubts about the short cooking times for the veggies and chicken, and also for all that flour used in the sauce. No herbs or spices added…. Doubts! The crust recipe seemed interesting but very little salt added. More doubts! Well, I guess it’s just me, but the pie was incredibly bland. The sauce tasted floury and was too dry! The crust had no taste at all! Needed more salt, at the very least. So this pie was supposed to be healthy. Maybe more so than others but yuk! Not worth it!! Hi Jenny. I’m Susan and 100% polish. My mother used to make the best Kapusta soup. She sadly passed away in 2006, and I haven’t had it since. She used to tell me when I was younger that different regions in Poland made their food their own way, so each recipe for the soup was different. My Babci—my mother’s mom—came from Krakow, Poland and her Kapusta was not soupy like most are. I want to say it almost had the same consistency as Split Pea Soup. She might have even put little yellow peas in it, but I can’t quite remember exactly. I’m reaching out to you to see if there was any way you can help me figure out a recipe for it or one similar to it? I’ve been trying for years to find someone who knows a recipe but no-one in my family, or any close friends can recall the one my mother & our family has used. I also wanted to express my love for your channel. Your way of cooking is exquisite and I very much enjoy watching and learning your recipes you share with us online! I hope you’re having a great Friday afternoon and continue to have a great weekend. Hope to hear from you, soon. Jenny, you are just the best healthy cook on you tube. 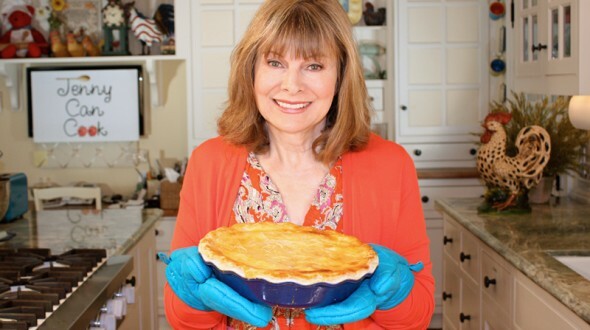 I love watching your videos as they are so light in humor, informative, and give me courage to embark on new recipes. I love you, Jenny! I was about to give away my two pie plates after having such embarrassing fails with pie crust. Instead, I shall try again with this wonderful easy recipe. I will be making this recipe for dinner for todays Pi Day (3/14)! Love being on your email for new recipes and have made many of them. Keep sending those and I hope you will make some more videos soon (I have seen them ALL)! Hi Jenny!! I grew up watching your talk show with my mom & sisters and was so excited to see you have a cooking website! It brought back so many fun memories of sitting with them each episode to see you. I made your pot pie last night during a snow storm here in the Midwest and it was the perfect comfort food to make & eat while watching the snow fall! The leftovers were delicious as well. I used a bag of frozen mixed veggies instead of fresh and came out beautifully. This is definitely a keeper!! I’M LOOKING FORWARD TO MAKING THE CHICKEN POT PIE. I LOVE WATCHING ALL YOUR VIDEOS;YOU MAKE THEM LOOK SO APPETIZING & FUN TO DO. CAN I USE CHICKEN THIGHS INSTEAD OF THE BREAST? This looks so good. I’m baking it tomorrow. Thank you, Jenny! You have enhanced my life with your recipes! Nice fall dinner with a salad. You are right, Jenny, don’t make the crust with WW flour. I used white WW (all I had) and it was okay, but not the best. Delicious-big hit with every one. Love your easy to follow directions and videos. Made the pie along with your easy no knead rolls. Yum! Love this!!! This was my first time making chicken pot pie ever and I just loved it. My crust was not glamorous because I don’t really have a rolling pin but I didn’t taste anything wrong with it. My husband didn’t like my crust but he said the filling was really delicious. Love your channel and your recipes Jenny! If you don’t have a rolling pin, you can always use a bottle, like a wine bottle instead. I have never left a comment online before, but I had to let you know how fabulous I think this recipe is. I had my doubts about the crust, but it was excellent – flakey and delicious and so easy to manage. My husband and I ate all but one (large) wedge in one sitting! Can’t wait to make it again. Thank you, Jenny for the recipes and for your hilarious on-camera delivery. Keep the great recipes coming. Jenny I’ve made this pie several times, each time it has been a success. I add heavy cream in place of milk and sometimes I add both milk and cream along with the olive oil when making the crust. Its an easy crust to make so no mental blocks to getting started. I also add a little heavy cream to the chicken mixture (I know, its in conflict with your healthy version of this dish). Thank you for sharing your wonderful recipe. My husband is a trained European chef, my son is a sous chef in a hotel in Waikiki, and my daughter- in- law graduated from culinary arts school. You can rank “Jenny Can Cook” in lights since they love it when I make this dish. You are clear in your instructions without unnecessary chatter. Mahalo (thank you) and Aloha to you, Jenny. Jenny thank you so much for this simple recpie. I have rehumatoid arthritis and have lost the use of my hands so my adult grand daughter has taken over the task of cooking I think she will just love this chicken pot pie as the clean up looks fast and simple also. A gain thank you for ALL the good taste recipes, Jenny. I just tried this with a few relatively minor changes. A slight accident (okay a fairly obvious accident) misreading the label at the farmers market and I didn’t realize I had bought ground turkey instead of the turkey thighs I had intended to use in this, but it still came out okay. I used whole milk and grapeseed oil, as they were all I had on hand, for the crust and it still came out good. Also, had a partial bag of frozen corn to use up and so they got tossed in with the peas, but this is a great recipe for using up bits of leftover vegetables. Very good overall, might add some herbs to the meat/vegetables next time though to give a bit more flavor. I 💘 your recipes. Pls tell me how to do this recipe with a top and bottom crust. I’m a two crust pot pie lover😍. Thank you for the 💘. I Would like to see an Bottom Crust to. I made this yesterday & it is delicious! Leftovers today were just as good. I love your healthy recipes & how easy they are to make. Thank you! I tried the chicken pot pie and it is delicious. Wow! This chicken pot pie is fabulous! For health reasons I have to be careful about fat so I used 1% milk and added a little corn starch and water mixture to the hot filling. Came out thick, creamy and delicious! We were thrilled with the results. Thank you Jenny! Already made this pie. It was awesome. Am making it again tonight. Haven’t made anything yet that wasn’t good and tasty. I love Chicken Pot Pie… Thank You!!! Extra light virgin oil is used for the crust as the healthier option but if that’s not an issue and all you have is vegetable oil and/or regular EVOO is that okay to use? I just want to confirm that it won’t affect the crust texture (newbie to any pastry/baking and have no idea) so thank you! You can use any flavorless oil but EVOO might leave an olive oil taste in the crust – I would not advise using it. Jenny, I have been searching for a healthier pie crust and you nailed it! I love this recipe it’s amazing, flaky, delicious and so easy! I did use butter milk in place of regular. Milk and I used grapeseed oil. Thank you so much. I love watching your videos, you have a great sense of humor and your videos are so informative, just perfect…. Hi Jenny! I have made many of your recipes and they have always turned out awesome. Until now. Last night I made the Chicken Pot Pie. Everything was perfect before I even put it in the oven – the filling had a wonderful, thick, creamy sauce and the crust was nice and flaky. I had to bake it an extra 5 minutes since I live in the high desert with about 2,000′ above sea level.When I pulled it out of the oven it looked amazing! Until I cut into it. The sauce was very watery. And I mean watery! Would you have any idea as to how that wonderfully thick, creamy sauce would turn into water? I’ve never seen anything like it. It was a hit ! Made it today. Very tasty, Thank you for another great recipe. I made your pot pie recipe today for the first time, for dinner. It was delicious! The gravy was so smooth and creamy and tasted wonderful! The crust was tender and flaky and came out of the oven beautifully browned and shiny from the egg wash. Will definitely be making this on a regular basis. Thanks!! My wife and I are going to make your chicken Pot Pie. Having had heart attack could you send me the Nutritional information, I am allergic to Soy, Soy Protein and Soy Lecithin. Jenny I used to work at the Holiday Inn in Pasadena as a Bartender years ago when you worked there and interrupted your performance when I turned on the Blender frequently, I also followed you one night with my buddys to the Lobster House in Marina Del Ray and I had taped the sound of a blender and turned it one when you started your performance. Ray. P.S. Not sure you will remember this! Well that brought back some memories! But sorry, I do not have nutritional information on my recipes. I wanted to know this for myself, so I calculated the estimated nutritional information for your recipe. I used the ‘MyFitnessPal’ app to acquire the information (great app). I figured 1/4 dish per serving, so 4 servings. 643 calories per serving (one meal) should be about right for most people. I hope others will find this information useful. Jenny, this chicken pot pie was awesome! And so easy! Hubby loved it. Fun making it with my Granddaughters, they loved it too! Love all your so easy yet super healthy recipes. I tell many people about you! I have been using rotisserie chicken from my warehouse club for quite a few recipes that require chicken. Lots of extra flavor. Can I use that cooked chicken in this pot pie? Yes. It would save you a little time and probably add some extra flavor. Love all your recipes. I sometimes just tune in to watch you cook . delightful. Hi Jenny, can u come up with nice and filling food for diabetic people? I finally tried out the chicken pot pie reipe after watching your video several times lol. It was awesome, me and my husband loved it. I also tried out 2 of your brownie recipes and your lemon cake. Which were all a hit. Thanks for all your recipes and I love your personality in your videos. You’re an amazing person. Hi Jenny, I made this pie for dinner and it turned out awesome. Thank your so much. The filling and the pastry were so good il probably make it again soon. I am your fan. I am planning to bake your chocolate cake and cinnamon rolls hope I nail them too. Thanks for the recipe !! Made the chicken pot pie for dinner last and it absolutely delicious without all the fat. Thanks again Jenny! I only post the recipes I make for myself at home as a hobby but I have added a metric conversion chart in the blog, which should be helpful. Hi Jenny, I made 5 small pot pies from this recipe. The crust recipe is only enough for 4 small pot pies but no problem. They are yummy! jenny, This recipe is a real keeper! I made it with two crusts and added some sliced mushrooms. I also added chopped parley and thyme as well as the celery leaves. the sauce was the best that I’ve ever had. thank you for this great pie. Made your chicken pot pie recipe but I used leftover turkey. We have not eaten it as yet in fact it is in the oven as I am writing this review. The recipe came out as described in your YouTube video. Your easy sauce sure takes the work out of making your own sauce with the butter, I tasted the filling before baking and thought that it was very tasty. The crust was a surprise but looked okay. Anxious to see how it backed and tastes with the completed pie. This could be my new favourite chicken/turkey pot pie recipe. It was fast and easy to make. I will certainly search your site for other recipes. Hi Jenny. I live in the UK and I cooked this Chicken Pot Pie this afternoon for my family and they loved it. No more brought pies! This is definitely one I will make again. The pastry mixture was a bit gloopy when I put it on top of the mixture (I think I needed to have added a tiny bit more flour) but when cooked it turned out fine. I am now a Jenny can Cook Fan!! and I look forward to making your other recipes and my family are looking forward to eating them!. It’s a shame I cannot find your cookery book on amazon.uk. You can download my cookbook for free on this website but I have improved a lot of the recipes from the book and added them here to the site as well. Just curious I’m trying to lose weight so I’m always looking for recipes. I just tried it and it came out great. I was scared to use white flour cause i was told it’s not healthy . Is it true? Can i use wheat flour? Whole wheat flour is always a better choice and I use it whenever I can, as long as the recipe still tastes good. For me, it does not work with pizza dough and pie crusts so I use all-purpose flour. I have got to ask. Do you really enjoy doing this as much as it looks like you do? Watching you have has turned this 61 year old man into someone that enjoys cooking. I absolutely love cooking, especially baking. I’m retired and could spend my time doing anything I choose and there’s no place I’d rather be than playing in the kitchen. Can I use canola oil to cook the filling instead of olive oil? Yes, any oil is fine. I love your recipes, I was wondering if you had already cooked chicken, could you use it instead of the raw chicken, and at what point would you add the cooked chicken to the recipe? Thank you so much for the wonderful recipes. I would add cooked chicken at the end of the filling process, when it’s thickened and just before you pour it into the pan. With this recipe and method – no, but you can find a different recipe that uses butter (the method will be different). Do you put the raw chicken in with the veggies just for 2 mins or is the chicken cooked before. The chicken is raw but remember after the 2 minutes, it continues to cook with the filling and also inside the pie. Hi Jenny! My oven temperature max is 250. So can I cook this stuff? Any advise? I wish I could say yes but recipes like this need a higher temperature. I’m sorry I’m not able to help. There are some cookies that can be baked at 250 Fahrenheit. I don’t know if this is relevant but you might check your oven to determine if it is Metric or Fahrenheit. I’m wondering why frozen peas are used? Will it make much difference if I use canned? Canned peas are very soft and would probably turn to mush in this pie. Do I have to use 1% milk for the crust? I only have whole milk… also do I have to use the extra light olive oil for the crust? or would regular olive oil do just fine? I can only guarantee this recipe if it’s made the same way I do. I have only made it this way so I’m not sure about your changes. I can only guess that whole milk might make the crust too heavy and that olive oil may be too strong for the crust. I have made the crust with other oils like canola oil and “Smart Balance” oil, both of which are flavorless. It’s a great pie and may be worth waiting until you get the best ingredients. can i use canola oil for crust instead of extra light olive oil? Yes, I have made it with canola oil. I’d like to try this butter free pastry to replace the other pastry recipes i make; do you think it’s worth a try for any of these? Sausage rolls, tuna pastry roll, borekas. Btw I love making your butter free recipes for friends who can’t believe they are butter free and still taste great! I don’t think this pastry will work for the items you mentioned because you can’t really roll it up. It’s a very soft pastry that is usually patted into a pie pan and if you try to roll it up around something, it will probably fall apart. I have never done a bottom crust but some people have and no one ever says they pre-bake it so I would say probably not to pre-bake it. I made the chicken pot pie. The filling was delicious and easy. I had trouble with the crust. It was very dry and would not come together. I finally got it somewhat together and just flopped it onto the filling. It didn’t fit all the way to the rim, but was just inside. It came out thicker than yours, but that’s because the more I tried to roll it thinner, the more it broke up. any ideas? I have tried many of your recipes and they have been great. My kids love the cinnamon rolls! 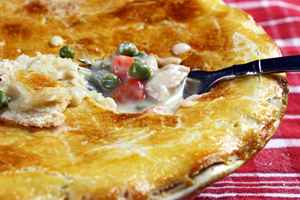 I will making the chicken pot pie today and I have no doubt it will be great too. Hi Jenny, i was wondering the size of your pie pan and where you got it? I’d love to try this recipe! It’s a 7-inch pie pan by Emile Henry: http://www.emilehenryusa.com/Pie-Dish-cat278.html and I got it at Sur La Table but other places also sell it. I first found your site through your no-knead bread recipe. I have not bought store-bread since! This chicken pot looks wonderful, and I want to try it. This is a lot of dinner for one person. Can you make this in individual ramekins and refrigerate some for the next few days? if so, how does using a small pan (the ramekin) affect the baking time? I have never made individual pies but it seems to me the baking time would be about the same. But just to be sure, I would check it at 15 and 20 minutes but I believe it will take the full 25 minutes to get a golden crust. HI Jenny i am new to you & your recipes, your meatloaf is for sure the best i ever ate, Tuesday is golumpkies, i’ve made stuffed cabbage before, but i’m anxious to try your method. But being from PA dutch country i must tell you this is not “chicken pot pie” it might be a chicken pie, but chicken pot pie, is just that. Chicken, potatoes, celery, & pot pie noodles. (bot boi noodles, if you buy em in a bag at the store.) And cooked in a pot, waa laa, CHICKEN POT PIE. I am glad i found you, i love your videos, & there are a lot more here i am going to try. Thank you again, & keep em coming. Can we use low fat milk for the filling instead of whole milk? I would not use low fast milk in the filling. I think it would be too runny. Hi Jenny, I was wondering if we can make a bottom crust for the pie. (Maybe double the crust recipe and bake half of it first before putting in the filling and top layer?) Would that work? If you look at Jonathan’s comment below he made a bottom crust and liked it. Also a lot of people commented on youtube saying they made bottom crusts with success. This was my first time making Chicken Pot Pie and it was delicious! I did make a few changes though. I substituted all of the all purpose flour (in both filling and crust) with white whole wheat flour and it came out fine! The sauce was still thick and creamy and the crust was still crispy, although somewhat denser (as expected from using whole wheat flour). I can’t believe how flavorful AND healthy this was! I will definitely be making this again. Thanks for the recipe Jenny! here is another idea…when ever we have roast beef, chicken or pot roast left over, not quite enough to have leftovers, i make pot pie with it, been doing it for years…..and with leftover chili i spread an 8oz package of cream cheese into a pie dish then shredded taco cheese on top of the cream cheese then left over chili on top of that and finish with taco cheese to cover the chili bake in 350 oven till the cheese melts…serve with tortilla chips or frito’s scoops, a great dip for parties too make a large salad and everyone loves this..and after the holidays i make a veggie pie with all the leftover veggies adding store bought ready to use alfredo sauce….also amazing with a salad and crusty bread brushed with garlic and olive oil!!! This chicken pot pie is AMAZING! I tried it with a bottom crust, came out perfect. I just created two of your crust ingredients, then brushed the entire inside crust with the eggwash. Very good! Thank you. Hey did u pre bake the bottom crust before adding the filling ? I made the chicken pot pie for my daughter the other night when she returned home from college for xmas vacation. I actually made two. She went crazy for it and my husband loved it too. Now we have the nachos in the oven and it looks like another winner. I made this yesterday and WOW! it is fantastic. I did add a Yukon Gold Potato cut in small pieces. Totally awesome, I will make this often. Thanks Jenny, now I will try your bread. Was it really that good? I hope so because I love chicken pot pie but I know hoe unhealthy they can be for you, but not Jenny’s. I’m a big fan of your cooking Jenny! All of your recipes that I cooked are amazing! Hope you can also post a recipe for shepherd’s pie. Bingo! It was amazing and there is nothing left:-( ! Thank you so much sweetie! I love your stuff! Can you use whole wheat flour instead of all purpose for the crust? I don’t think whole wheat flour works in this recipe. The result would be too heavy and dense. I added some left over mushrooms and rosemary to this. That sauce again is just super, it tastes so rich. Can this crust be used to make empanadas? I ask because I’m trying to make the empanada dough without using butter and I don’t have any transfat free spread on hand at the moment. I think this dough would be too hard to handle to make empanadas. It’s essentially a dough to be pressed into a pie pan but I roll it between wax paper to make handling it easier. But you could search the internet for empanada recipes that use oil – there may be something out there. I’m not sure but I think you would have to bring the filling and its pan up to room temperature before adding the crust and baking. Today is my 3rd time making this pot pie, thank you so much for sharing. Im lactose intolerant, so I use the Lactaid milk and it still comes out perfect. My kids love it. Thanks for the great recipe, I’ll never have to buy it from the store again! Can’t wait to try this, but first a very non-nutritional question. Can a bottom crust be added? And if so I assume there might be some necessary adjustments to make? Any ideas would be appreciated. I can’t wait to attempt this…. Okay, so I made this recipe for dinner last night and it came out pretty good. I’m going to have to work on the crust a little though, The way that I made it had no taste…I’ll work on it, but other than that I really enjoyed making this dish from scratch. There usually isn’t much taste in the crust except from the salt so make sure you include the salt or maybe add a little more for your taste. Eating this right now. So good! Jenny you are a genius !! My family loves chicken pot pie, i will be using this recipe from now on. Thank you for all your posts & God bless you. Beautiful…. I could smell it and I could taste it….Yum!!!! This the only crust recipe I use too. So easy and flaky and delicious…… Thank you for sharing…. I’am sure going to try this pot pie recipe. Your recipes are awesome. I love your counter top. What colors are in it? At first I thought it was gray but today I thought it looked green. The countertop is green granite. I shopped for months to find the perfect kitchen counter. I’m glad you noticed. Love the new Chicken pot pie recipe Jennie. You had me salivating at the end. This is going to be on our table this weekend….can’t wait. PS…Love the cow! Chicken Pot Pie – one of my all-time favorites. Can’t wait to try it! Thanks for making it so much healthier than usual. The pie pan is by Emile Henry and I got it at Sur La Table. Hey!!! I just noticed you are holding up my new pie plate! (Except mine’s yellow). They’re on sale at Sur La Table. I also purchased other items from the line. Very pretty colors and pieces. The deep dish serrated-edge pie pan is also available from Amazon.com.